The Woman Who Died a Lot was read as part of the Wishlist Challenge. 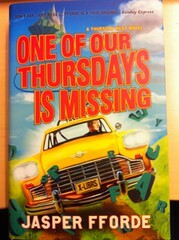 This is the seventh book in the Thursday Next series. 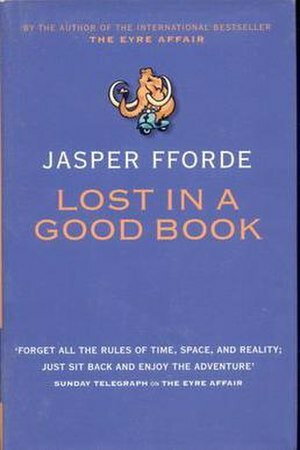 You can read my reviews of the previous 5 Thursday Next books by using the Thursday Next or Jasper Fforde tags. The BookWorld’s leading enforcement officer Thursday Next is four months into an enforced semi-retirement following an assassination attempt. She returns home to Swindon for what you’d expect to be a time of recuperation. If only life were that simple. Thursday is faced with an array of family problems – son Friday’s lack of focus since his career in the Chronoguard was relegated to a might-have-been, daughter Tuesday’s difficulty perfecting the Anti-Smote shield needed to thwart an angry Deity’s promise to wipe Swindon off the face of the earth, and Jenny, who doesn’t exist. And that’s not all. With Goliath attempting to replace Thursday at every opportunity with synthetic Thursdays, the prediction that Friday’s Destiny-Aware colleagues will die in mysterious circumstances, and a looming meteorite that could destroy all human life on earth, Thursday’s retirement is going to be anything but easy. As with the previous book The Woman Who Died a Lot read much more like a series book than the previous books did. That is that it is harder to understand if you didn’t read the previous books. I found that this book was a little more predictable than the others. I quite often guessed what was going to happen before it did, which hasn’t generally been true of the Thursday Next books. However enough was confusing and there were enough twists that I didn’t guess everything, so it was still exciting and intriguing enough for me to want to keep reading it. I did kind of miss the bookworld element which wasn’t in this book, and the literary references were a bit less frequent. Eagerly awaiting the next one now. Alison @ Piling on the Books. Today Post a Day/Post a Week have put up a post to tell us all that we are 33% of the way through our goal (which is a third of the year, can you believe how fast it’s going? I was looking forward to this book for such a long time, and I had lots of expectations from having read the rest of the Thursday Next series, from reading other peoples reviews of the book and from going to see Jasper Fforde when it was released, so it made for a pretty good review book I think. I got this book early and I was eager to let everyone else out there know what it was like before it was released, I think I did pretty good in describing how the book was without giving too much away, although maybe I was a little heavier than I would have liked on the spoiler tags. It’s also one of my most frequently visited reviews. What are some of your favourite posts on your journal? On my journal? And on other journals? For the purposes of this review Thursday refers to the real life Thursday Next, Thursday refers to the written Thursday Next. Having said that having Thursday speaking made a big difference which somewhat slowed down the plot I did like the new Thursday. She was much more pondering and less action focussed than Thursday and it felt like she was discovering things along with the reader rather than leaving them puzzling. I suppose that could be a bad thing but at points she left little tantalising details which suggested that she knew more, I liked that because it made her seem more like a written person, like she was trying to make a narrative, and it kept me interested to find out what she knew. There were a lot of things I did love about this book. I loved how where before there had been references to novels now there were references to writing, I especially liked when the characters got lost because of lack of references to who was speaking! I loved Thursday, she was like a softer version of Thursday and it was nice to have a little change, even if it meant the book was more pondering. I loved learning a bit more about the book world, about the politics, about how in joined up and how different areas interacted with each other, supported by the rather intriguing map at the beginning and the quotes from Bradshaw’s Guide to the Bookworld. There was less about the real world too, I always preferred the Bookworld side of the storyline so I liked that. Plus where the real world was included in the story I found it really interesting to see it from a fiction point of view. Again the end seems to lead on to another Thursday Next novel which makes it seem more series like than it once was. In ways I don’t like that, it somehow makes Thursday Next seem more commercial, but I won’t complain about there being more to come! Thursday Next is back. And this time it’s personal . . .
Officially, Literary Detective Thursday Next is off the case. Once a key figure in the BookWorld police force, she is concentrating on her duties as a wife and mother. Or so her husband thinks . . .
Unofficially, Thursday is working as hard as ever – and in this world of dangerously short attention spans, there’s no rest for the literate. Can Thursday stop Pride and Prejudice being turned into a vote-em-off reality book? And will Thursday get her teenage son out of bed in time for him to save the world? I must admit to start off with I wasn’t especially impressed with First Among Sequels when compared to other books in the Thursday Next series, it seemed pretty slow to get going and it felt like more of an artificial sequel than the others had. It felt a bit like it had been written for the sake of writing another rather than because the series lent itself to a further book after Something Rotten. Having said that we did know that books would be written about Thursday at the end of Something Rotten and the idea of a fictional Thursday is a little too intriguing to pass by. The different Thursdays were very well done too, it created so much comedy, especially when the two fictional Thursdays were so different from each other. There were some very clever parts of this book too I especially liked (highlight for spoiler)when I thought the ‘real’ Thursday had won only to find out that the voice we presumed to be Thursday was Thursday 1-4, but then actually found that Thursday had planned for that all along! In fact I really liked all the playing round with the different Thursday’s identities. 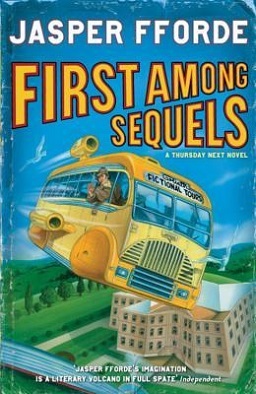 In retrospect First Among Sequels could actually be my favourite Thursday book. I thought it would be good to make a post for International Woman’s Day (which, if it has managed to pass you by, is today) So I thought I would make a post about great women in literature. I would love to hear your own thoughts on this, who else would you include? Who wouldn’t you include? 1) Lyra Belacqua/Lyra Silvertongue (His Dark Materials- Phillip Pullman): Lyra’s quest in the first of the Northern Lights starts as a quest to save her friend, but as Lyra grows it becomes a fight for her beliefs and what is right. 4) Thursday Next (The Thursday Next Series- Jasper Fforde): I find Thursday Next especially strong in Something Rotten, not only is she fighting the criminals, but she’s also fighting the establishment, the corporation, fighting to have her husband re-actualised and being a single parent! 5) Minny (The Help- Kathryn Stockett) Minny doesn’t take rubbish from anyone, even though she may be better off fearing. She holds together her family and is a great friend. When she is loyal she stays loyal but you certainly don’t want to get on the wrong side of her! 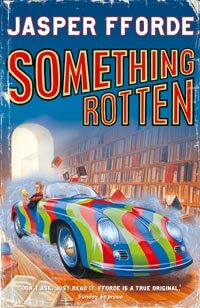 Something Rotten is the fourth book in Jasper Fforde’s Thursday Next series. Thursday Next, Head of JurisFiction and ex-SpecOps agent, returns to her native Swindon accompanied by a child of two, a pair of dodos and Hamlet, who is on a fact-finding mission in the real world. Thursday has been despatched to capture escaped Fictioneer Yorrick Kaine but even so, now seems as good a time as any to retrieve her husband Landen from his state of eradication at the hands of the Chronoguard. It’s not going to be easy. Thursday’s former colleagues at the department of Literary Detectives want her to investigate a spate of cloned Shakespeares, the Goliath Corporation are planning to switch to a new Faith based corporate management system and the Neanderthals feel she might be the Chosen One who will lead them to genetic self-determination. With help from Hamlet, her uncle and time-travelling father, Thursday faces the toughest adventure of her career. Where is the missing President-for-life George Formby? Why is it imperative for the Swindon Mallets to win the World Croquet League final? And why is it so difficult to find reliable childcare? I seem to forget just how much I love Thursday Next between reading one book and the other, this one was no exception. Funny, exciting, and rather odd. I love Thursday and I liked the addition of some of the new characters. How you can get so much humour from a baby I don’t know but I loved Friday, and I really liked Alan too…although I did miss Pickick’s ‘tricks’ a bit. I loved all the fiction related references and jokes, as always. I don’t think there is really anything specific I want to say about this one. Or at least not that I could say without spoilers. I think it has been my favourite Thursday Next so far though, I just wish I hadn’t waited so long to read it. Last night was a very exciting night for this reader. I went to a talk by/with Jasper Fforde at my local (and very favourite) Waterstones on Birmingham New Street. I can honestly say he’s a very entertaining speaker, and just as funny in real life as he is on the page. The Eyre Affair was only originally meant to be a stand-alone book but the publisher asked for more. One Of Our Thursdays is Missing is the only one (at least so far) that is really a sequel as in your couldn’t understand it if your hadn’t read previous Thursday Next books. He is currently working on the next book in The Last Dragonslayer series…which I haven’t read yet. I am really excited about the prospect of reading One of Our Thursdays is Missing now…but reading First Among Sequels first may be helpful! Thursday Next, literary detective and newlywed is back to embark on an adventure that begins, quite literally on her own doorstep. It seems that Landen, her husband of four weeks, actually drowned in an accident when he was two years old. Someone, somewhere, sometime, is responsible. The sinister Goliath Corporation wants its operative Jack Schitt out of the poem in which Thursday trapped him, and it will do almost anything to achieve this – but bribing the ChronoGuard? Is that possible? Having barely caught her breath after The Eyre Affair, Thursday must battle corrupt politicians, try to save the world from extinction, and help the Neanderthals to species self-determination. Mastadon migrations, journeys into Just William, a chance meeting with the Flopsy Bunnies, and violent life-and-death struggles in the summer sales are all part of a greater plan. This book seemed much more like part of a series that The Eyre Affair did, partly because knowing what had happened in the previous book was fairly important (of course that couldn’ happen with The Eyre Affair because it was the first one! ), and partly because at the end the story didn’t quite seem finished (highlight to view spoiler) while it was a conclusion in a sense and deffinately a good stopping point, the fact that Landon was still lost means that part of the plot was left incomplete, meaning you cannot get away with not reading the next book. I must admit this put me off the book a little as I felt I was (in a sense) being forced to read the next in the series, I would have read it anyway because I have enjoyed the series so far but I would have liked to feel I had some choice in it. I found this story a little more confusing than the last too, with allthe jumping in times, between worlds and distortions in probability, but it was just as exciting. I also found that I understood less of the references to literature in this one- although I’m sure people who have read the books refered to would understand them, and well having read them would have added something to the plot it wasn’t necccersary. I do think because of this I prefered The Eyre Affair though, but not by a significant ammount. I want the next one now!